With your Live Meeting analytics, you can see analytics that show when your viewers were paying attention to your presentation. Select More, Performance, Live Meetings and choose one of your recent Live Meetings from your list. Selecting a live meeting will bring up your analytics for that particular meeting. This will also be shown to you as soon as you end a live meeting that you have hosted. 2. After selecting the Live Meeting who’s details you would like to view, you will see the visual analytics for this meeting. Scroll down until you can see the top and bottom portion of the analytics we offer. 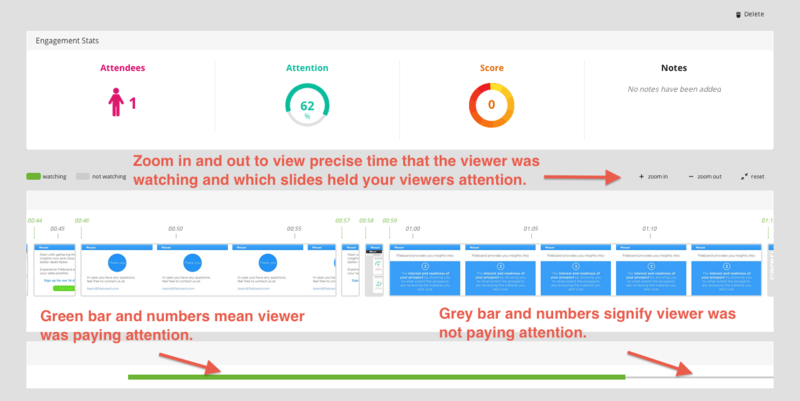 In addition to the number of attendees, attention percentage and score, you can see the actual viewer attention of your presentation. Notice the green numbers and grey numbers. Green will mean that your viewer is on the tab of your live meeting and has your attention there. Grey means that the viewer is viewing a different tab, looking at email, Facebook or something besides the slides you are showing. Viewing where and when your viewer paid attention is huge in deciding what information they saw and what kept their attention. This is just one of the powerful tools we give you.